Known as the Tiger's Nest and the Taktsang Palphug Monastery, Paro Taktsang is considered one of the holiest places in Bhutan. 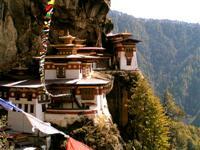 Located in the Paro Valley, the monastery is perched on a cliff 2,950 feet (900m) above the valley floor. The monastery has been an important site for pilgrimage and meditation in Mahayana Buddhism since it was built in 1692 around a cave believed to be the birthplace of Buddhism in Bhutan. Tourists can reach Taktsang Monastery via a 20-minute drive from Paro to the base of the mountain, followed by a two-hour hike (or pony ride) to the monastery.